In the 18th and 19th century a popular form of entertainment for the sophisticates of Edo, Japan (which is present-day Tokyo) were sideshow carnivals (known as misemono). The sideshows featured a myriad of educational and entertaining attractions designed to evoke a sense of wonder and satisfy the curiosity of the mysteries of life. A popular attraction was the Pregnant Doll (they were also believed to teach midwives how to deliver babies). 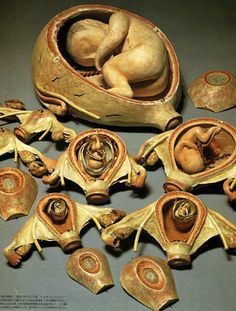 The doll’s abdomen could be opened to reveal fetal models depicting various stages of prenatal development.